As many of you may already know, the University of Pennsylvania closed down operations this past Monday and Tuesday due to the impending Hurricane Sandy. I think that everybody ought to keep checking the skies to make sure there are no pigs flying around up there. Over the course of the past few days, I remained hunkered-down in my suburban New Jersey home with plenty of junk food, DVDs, my guitar, and, of course, my never-ending supply of homework. Over the last several days as the devastation unfolded on news forecasts and online reports, my thoughts were (and remain) with those who truly felt the disastrous effects of the hurricane, but, fortunately, my area was largely untouched and I simply received a free, long weekend, which I unknowingly and completely took for granted.. That is, until I arrived at the Sweeten Alumni House this morning and Nicole Maloy, W’95, and director of Multicultural Outreach, helped me to appreciate just how rare the closing of the University really is. She told me of the great “Ice Storm” of 1993 and another in 1995, both of which closed down the University, and I remember a great snow storm a few years ago during which the University closed down operations, but it truly is not an event that occurs often. It really takes a big storm to close this place down! 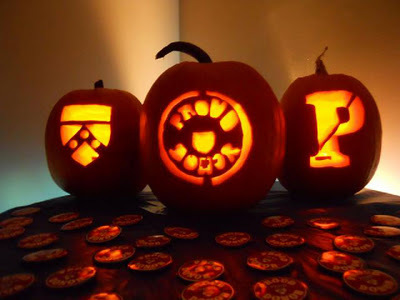 Luckily, Sandy left campus and the city of Philadelphia relatively unharmed, and the University has reopened just in time for Halloween. Alas, the long weekend for students and employees has come to an end, and I believe it bears repeating: don’t take days off for granted! Image Courtesy of Dueling Tampons. I often complain about the erratic weather in Philadelphia. 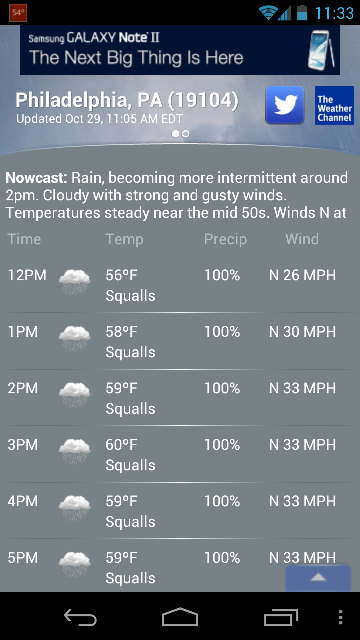 Thanks to Hurricane Sandy, yesterday’s forecast was very consistent. Penn is still closed today, but will hopefully be open tomorrow. Stay safe, everyone! Filed under Alumni Perspective, Stephanie Y.
I intended for today’s post to be a funny, yet poignant and insightful, photo-filled recap of the Homecoming Weekend events. But then Hurricane Sandy arose. The name seems so benign; it makes me think of the scruffy and lovable mutt in the musical, Annie. How bad could it be? By all accounts, it’s rabid. I learned early yesterday morning that all classes were cancelled at Penn for the next two days, and that only essential staff were required to report in to work. I couldn’t decide at first–was I essential staff? I consider myself necessary in so many ways. But then I received an email from Kristina, our Alumni Relations guru to all things staff-related and realized that unless I planned on joining the facilities team, I needn’t report. I have to say that Penn’s quick and decisive response to the storm, and the numerous follow up emails we received from our VP and HR reps were very helpful and set my mind at ease. Okay, so you’ll have to wait until Wednesday to see our Storify recap of Homecoming Weekend–we’ll give you a complete look at all of the tweets and related photos shared by alumni, friends, and staff over the last three days. Until then, here are a few tips for surviving the storm. You can trust me on these–I spent my childhood and teenage years living in Florida where hurricanes, like debutantes, have their own seasons and where one lives in a constant state of low level anxiety due to both the volatile weather and an abundance of flying Palmetto bugs. 1. If you have a patio, bring in all of the IKEA furniture and set it up in your living room so that the cats can inspect it. You should do this because the gale force winds are supposed to be at like 500 miles an hour. Strong winds can take one of these innocent looking fake plants and hurl it into your back window, shattering the glass and requiring you to spend the rest of the storm in your bathroom, which is way too small. 2. Stock up on foods that don’t require electricity to prepare (i.e. microwave popcorn or frozen foods, particularly those delicious Amy’s spinach and feta pizzas). The alarming news stories say you should have enough food for three days to a year. 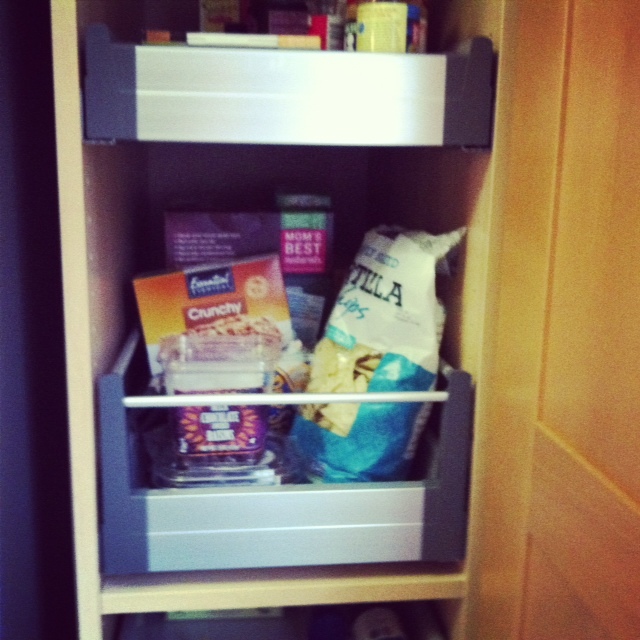 I bought a lot of cereal and snack items, along with cold cuts and bread. My still-living-in-Florida mom reminded me that if the power goes out, I should keep the refrigerator closed most of the time so that the milk doesn’t spoil. I’m glad she reminded me of this, because sometimes, instead of turning on the air conditioner, I just leave the fridge door open all day. 3. Buy batteries for that transistor radio you have or I guess, if you live in modern times, extra batteries for that smart phone thinga-ma-jig charger nonsense. 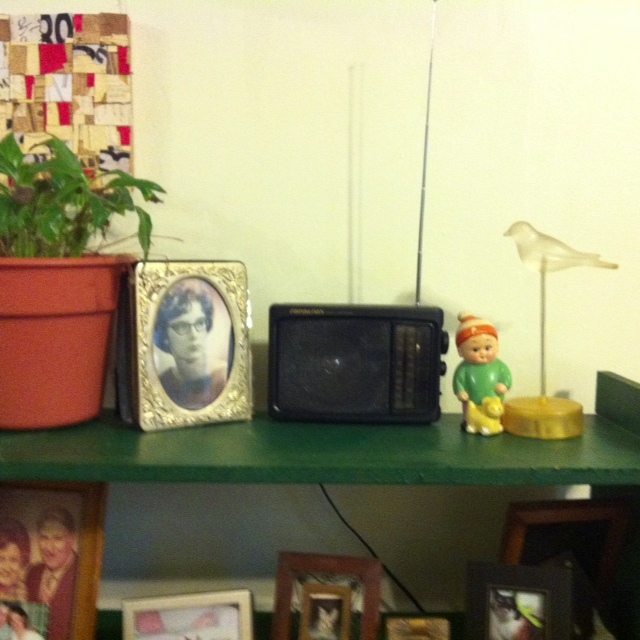 As an aside, that framed photo is my mom’s high school graduation picture. I love those cat eyeglasses so much. 4. Keep matches and candles in every room, and be sure you have other activities lined up in case the power goes out and you can’t watch Bravo’s Real Housewives of Suffolk County marathon. I recommend reading actual books (your Kindle will eventually die). Currently, I’m reading a novel billed as a “haunting ghost story,” which seems a little redundant, but also perfectly suited to candle light. I can pretend I’m Jane Eyre and try very hard not to lean in too close to the flames, singeing my eyebrows. 5. Have extra everything. I spent about 45 minutes on Sunday, scouring the house for boxes of matches, and congratulating myself for finding two actual flashlights that work. I also bought 24 extra water bottles. Sorry, Liz Pinnie (our Penn Alumni Relations eco rep). 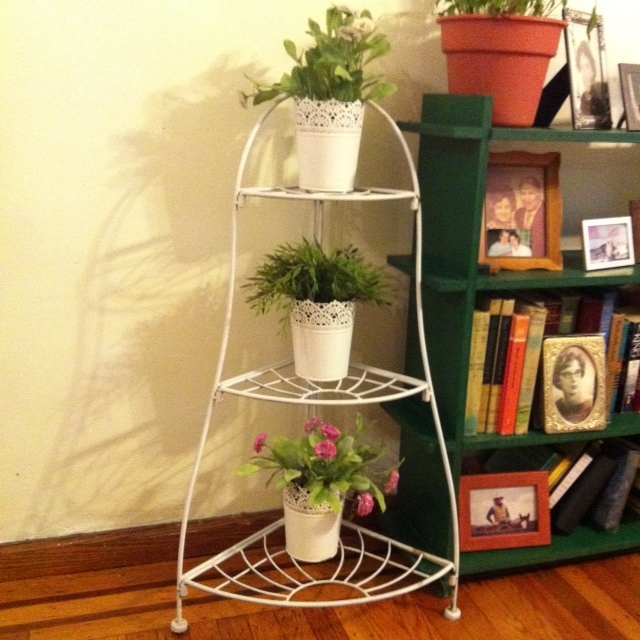 They are made from 30% plants and are 100% recyclable. 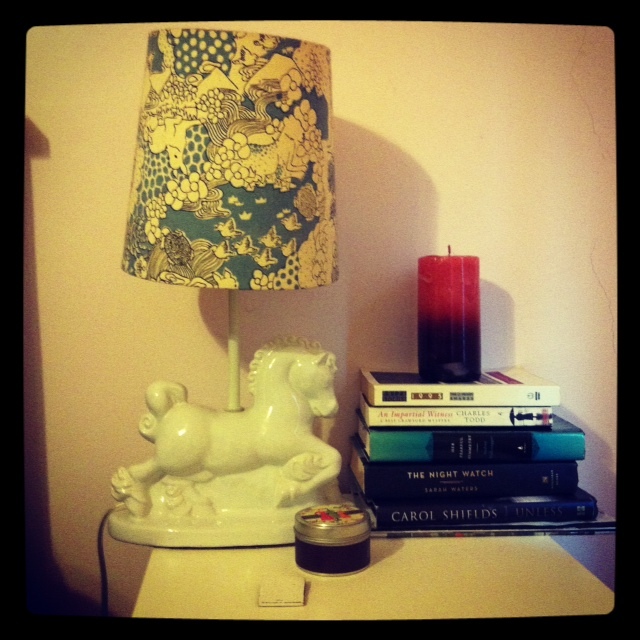 And I discovered taper candles–no clue where they came from. 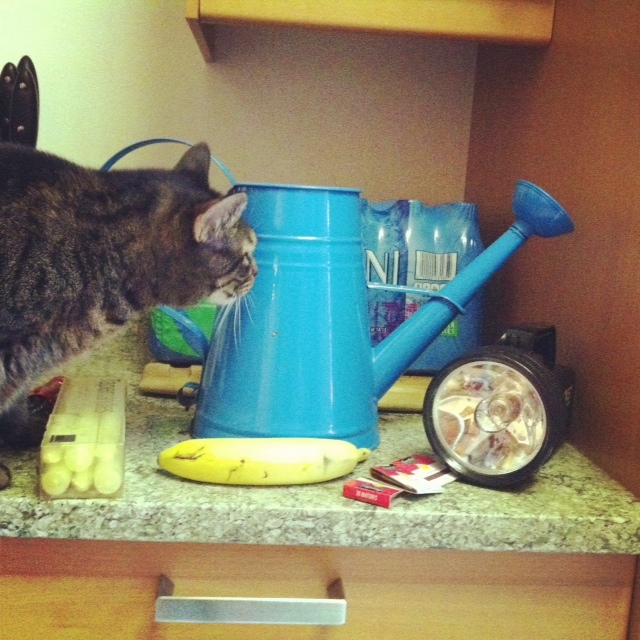 Another tip from mom: fill the bathtub or an extra watering can with water in case the toilet stops flushing. I forget why this would happen, but I listened to her because I am a good daughter. Obviously, buy more than one banana from the grocery store unless you’re taking this opportunity to start a fast. 6. Have an evacuation plan in case the worst occurs and the water rushes forward from whatever river that is to the East of me. 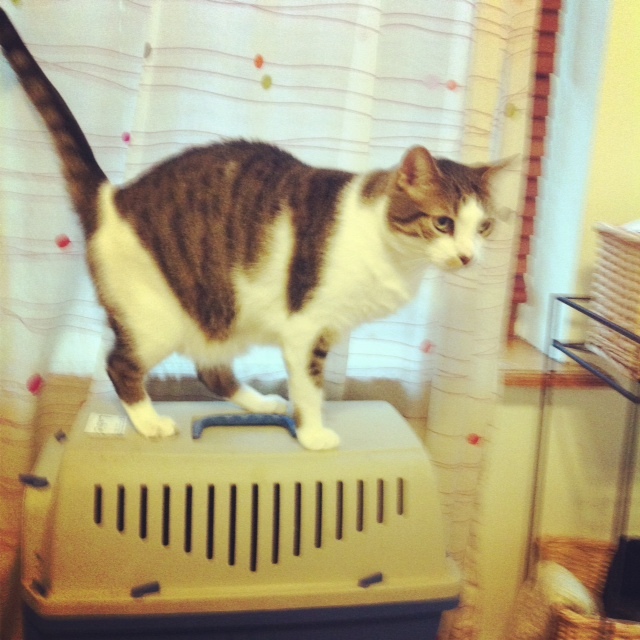 I brought the cat carriers up from the basement because I have this fear that the entire basement will flood all the way up to the steps and I’ll need a boat to get anything out. I read Stephen King’s The Stand at a very impressionable age and so harbor this terror that the end of the world is right around the corner. This also comes from growing up in a place where cockroaches were liable to turn up just about anywhere–falling out the branches of a tree and landing in your neckline while you were riding your bike to school, for instance, causing you to simultaneously crash your bike into a tree while screaming and ripping off your shirt in front of Bobby Bander for no apparent reason that he could see, which led to him avoiding you in the hallways ever after. Note: cats will likely not allow themselves to be crammed into these boxes and so will have to be left to survive on their own. 7. Most importantly: take care of one another. That’s what happened early on in the storm with reassuring messages from the Penn administration and my Alumni Relations co-workers. I felt like I was well-informed and that they’d taken into account my safety first, over and above the needs of the University’s daily operations. So, you know, let your neighbor borrow one of your 20 boxes of matches if she needs them. We’ll all make it through just fine. 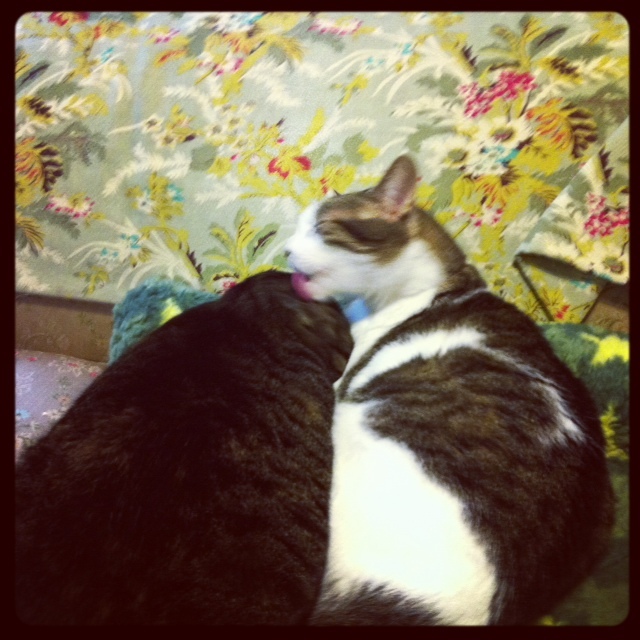 The blob that Ernesto is grooming is actually Emma Carol, made even fatter by the extra food I’ve been giving them to assuage their (my) anxieties. Stay safe! 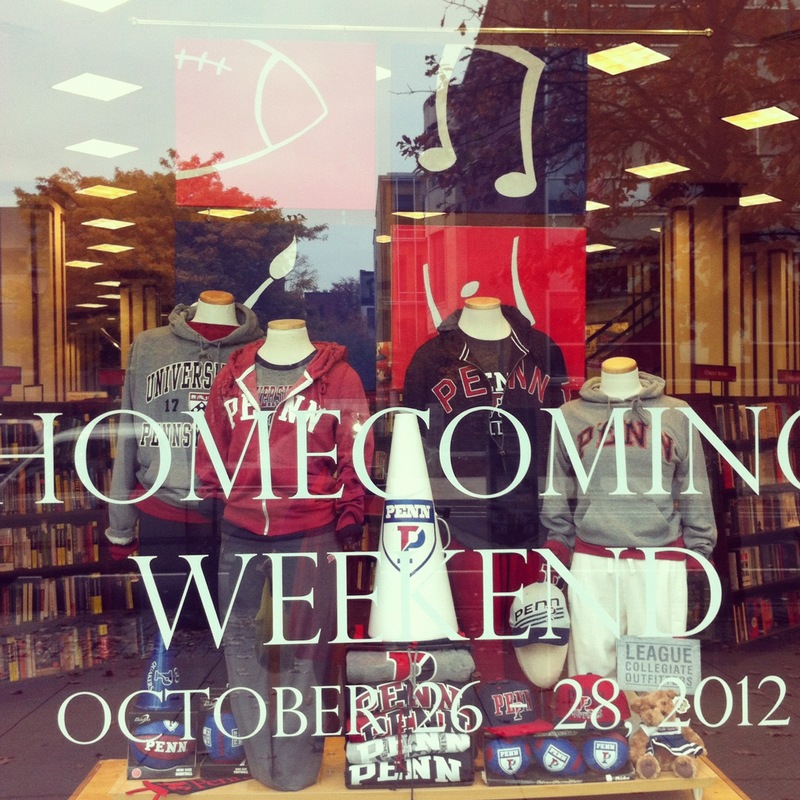 In case you didn’t know, it’s Penn Homecoming Weekend! 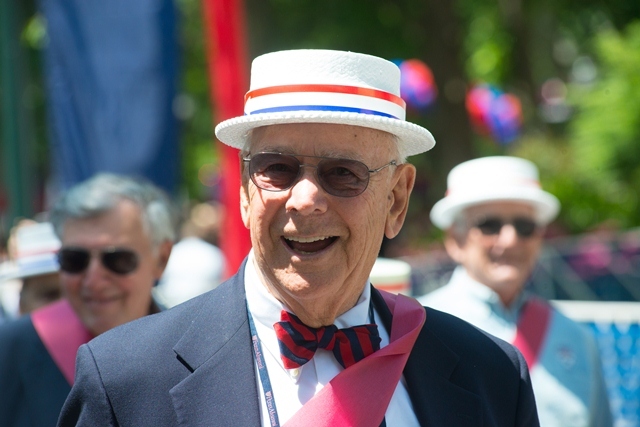 The foliage is blooming, Locust Walk is abuzz and alumni young and old are returning to campus to experience and participate in the Arts & Culture at Penn (as well as a little Penn Football and other athletic contests – Go Quakers!). As I sat at the Homecoming registration tent (on Locust Walk right across from the Sweeten Alumni House), I met two enthusiastic alumnae, Jacqui Schneider, CW’47, G’49, and Jackie Wiegand, CW’48. They met at Penn many years ago, and remain friends to this day. Jackie said she was the maid of honor in Jacqui’s wedding, and Jacqui was the matron of honor in her wedding. Jacqui Schneider, CW’47, G’49, and Jackie Wiegand, CW’48, outside the Sweeten Alumni House. They were looking for Van Pelt Library, so I pointed them in the right direction, but they also wondered about Bennett Hall – is it still here? Yes, it is, but now it’s Fisher-Bennett Hall, and since its renovation a few years ago, it’s in wonderful condition. Jacqui remembered a coffee shop that used to be at 34th and Walnut that’s long gone. They wondered about their old dorm. They were looking forward to seeing the woman that was the Dean for Women when they were students – she’s going to be at the Old Guard Brunch tomorrow morning. Jackie asked about Smokey Joe’s – is that still around? Yes, it’s now at 40th and Locust Streets. She then told us that her brother took her there when she was a freshman and she had her first alcoholic drink there…I bet she’d still get carded today! Welcome Home Jacqui and Jackie, and welcome home to all Penn alumni, who always seem to be young at heart when they return to Penn. And, Go Quakers! Beat Brown! Being on an intramural sports team at Penn is a unique experience. Last semester, I played intramural basketball, and while it was fun, we lost most of our games. It was also stressful to be the captain, and be responsible for a $100 performance bond if your team decided to not show up one day (this almost happened). 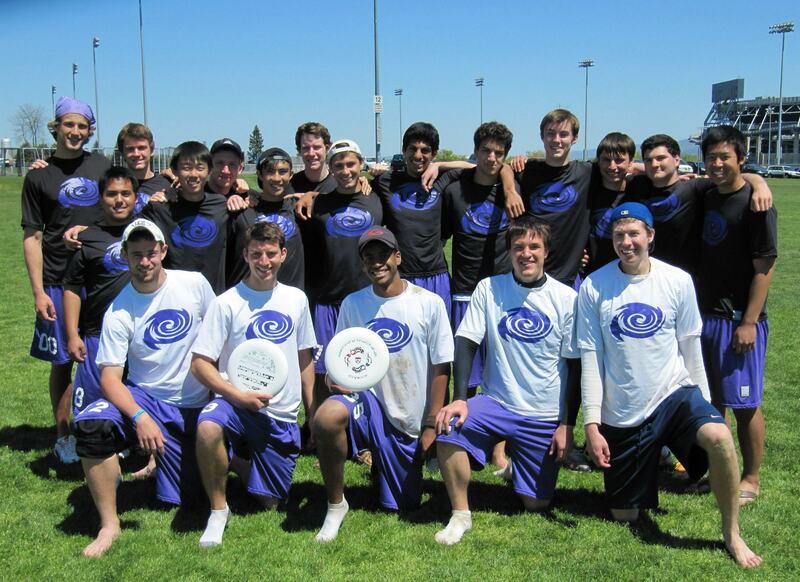 But this fall I found a new group and a new sport – Ultimate Frisbee. Ultimate Frisbee is interesting in its own right. There are no referees, and the game is completely self-policed by the two teams. The only outside intervention is from a Penn Rec employee calling out the end of each half. The objective is simple – catch the Frisbee in the end zone. But as the game plays out the intricacies present themselves – making a quick step to get open, diving to knock away a Frisbee and defending one side of the person throwing the Frisbee all become clear. But this is not professional Frisbee, in fact far from it. We are a group of friends trying to have some fun. This attitude produces some memorable moments. Like the time we were winning by five points, and my roommate Surya called a time-out to set up a victory celebration. When we next scored, our team lined up like bowling pins and I “bowled” the Frisbee and knocked everyone down. Even the other team thought it was funny. We also have a pre-game chant involving group circle and much loud chanting of the word “WORK!” and our team name’s acronym (Discs of Glory – so DOG). While much of the game is fun, there is a lot of intensity also. We have had multiple last-second catches to end either a half or the game, lots of diving, and even some more serious collisions. Last week, Surya and another teammate slid to the ground in the corner where there was dirt and came up bloody. A few weeks prior, Surya was hit with a shoulder the head on a contested catch that looked like a football highlight hit (he was ok). Through all of this, we have had a great time and have grown closer as friends. We have out last regular season game on Tuesday, and then it is off to the playoffs. The season has been full of ups and downs so far, and I am sure that will continue. The game on Monday is a rematch against the only team we have lost to so far, and it is sure to be another close one. The first time we played this particular team, they won on a last-second catch in the end zone, and neither of us has lost since. It seems only fitting that I end this piece the same way we end our pre-game chants. No matter what happens, at the end of the day, DOGS WORK! I’m not a particularly big fan of khakis. It might have to do with the fact that from the ages of seven to seventeen my only “casual wear” pants were khakis. Yes, I dressed like a mom. No, it did not help my social status. When I (read: my friends) finally forced myself to put on a pair of jeans in an attempt at social rectification, I discovered that jeans were 1. not nearly as tragically uncomfortable as previously assumed and 2. The Best Thing Ever. Since these discoveries, I have been a practicing Non-Khaki-Wearer. However, Penn’s Homecoming Weekend featuring arts & culture might just change all of this. With Homecoming on the horizon, I can’t help but get a little Penn-giddy. I’m excited for the heart thumping beats of the Penn Band, the shouts of the cheerleaders, and the vibrant crowds of alumni and their families. At the risk of sounding a bit shallow, I’m also terribly excited for the outfits. 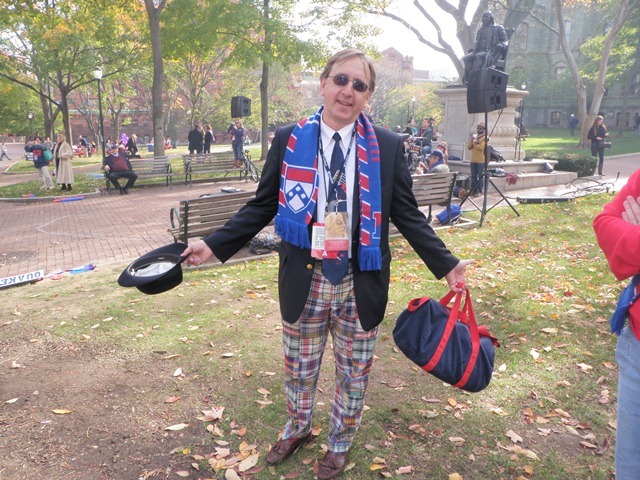 At every Penn event I’ve attended, I’ve become more and more impressed with the massively creative Red & Blue wardrobes that our alumni pull out. As someone who loves colors, looking up Locust Walk and seeing the rich reds and bright blues, the boaters, the madras, all surrounded by the yellows from the leaves on the trees, is a real treat. However, it isn’t just my love of outfits, or color, or fashion blogs that makes this vision so enjoyable to me. Rather it’s what these sometimes over the top outfits mean: our Penn Alumni are proud of Penn, and they want to show their pride in any and all ways possible. So I’ve decided that this is my year to join in. After work today, I’m headed on a quest for the most ridiculously vibrant red or blue pants to couple with a nice Penn rugby, which I plan on topping off with a classic Penn scarf. Too much? Never! When there’s Penn Pride, you might as well show it. 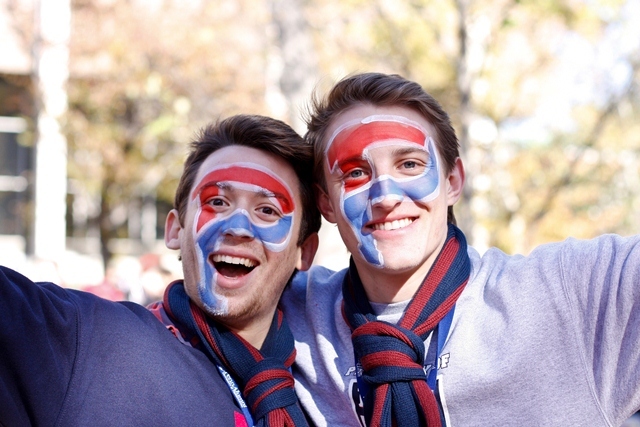 Hope to see you all this weekend, for some serious Red & Blue. Filed under Alumni Programming, Athletics, Campus Life, Homecoming Weekend featuring arts and culture, Liz P.
We are counting down the hours until Homecoming Weekend featuring Arts & Culture this Friday and Saturday. Though our online registration has closed, all alumni and friends are welcome to walk on to join the fun at any time. Once you’re back on Locust Walk or cheering at Franklin Field, we also invite you to share your stories and photos via our social networking channels. Here are just a few ways you can use online networking to make the weekend even more enjoyable for all involved. Twitter: You can tune into our live tweets throughout the weekend by following us on Twitter, and we also ask that you share your status updates on your own Twitter account by using the special hash tag: #PennHW. 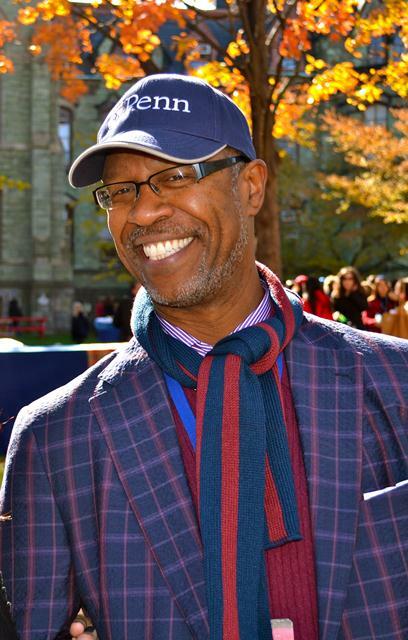 Facebook: Go ahead let your friends now that you’ve returned to Penn for Homecoming through Facebook posts—you might even inspire them to hop in a cab to join you at the Taste of Penn. Once the weekend is over, we’ll be searching for posts and tweets related to Homecoming and using them to create a Storify memory of the weekend that you can share. Mobile app: Need to find the location of an event? Want to check out the Look Who’s Coming list? Interested in creating your own personal schedule for the weekend? 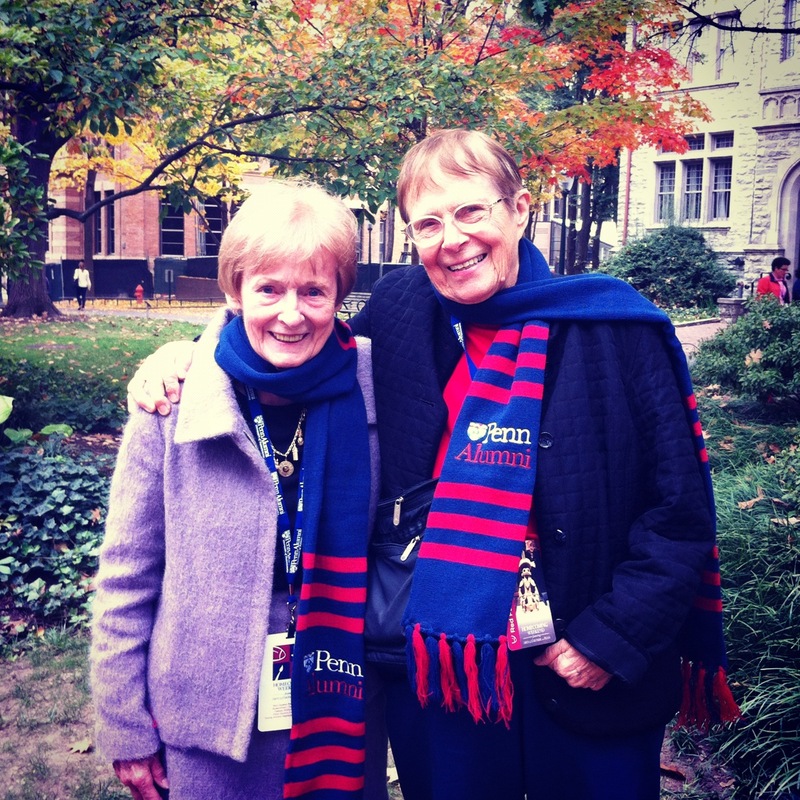 Go to the i-Tunes app store to download the free mobile app by searching for “Penn Homecoming Weekend.” You can also view the mobile version of the website on any smart phone by using the web browser and directing it to: http://www.alumni.upenn.edu/mobilehomecoming. 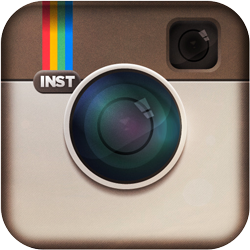 Instagram: If you have an Instagram account, join Penn Alumni’s Instagram stream and share your photos with us. We want to see your best pictures of you and your friends as you enjoy the many activities during the weekend, and especially during the football game as you cheer the Quakers on to a sure win against the Brown Bears. Finally, if you’re still teetering between whether to come back to campus this weekend, maybe I can sway you with one more push via social networking. Enjoy this short video snippet of the arts-related programming that you’re sure to love. See you soon!